Artist don’t try to show the world as it is, yet try to show the truth that sometimes is hidden by reality. 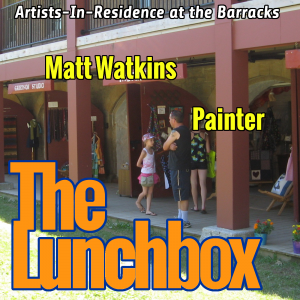 During the summer, the Fredericton Arts Alliance brings a pair of artists together in the Barracks to practice their art for all to see. These artists come from a wide variety of disciplines, from painting and sculpture to basket-weaving and writing. As each pair of artists comes in, we’ll be talking to them on the Lunchbox. My guest today is Matt Watkins (Instagram), an artist primarily working in metal jewelry, but in the barracks this week to demonstrate his interest in plein air painting (Facebook). We talk about the process of going out in nature to find that perfect inspirational moment, which is transformed by the artist’s vision into a representation.